A European Union (EU) commissioner on Saturday said the union must accept Turkey's internal security and terrorism concerns, citing the Turkish state's disquiet about Gülen Movement, reported the Hürriyet Daily News. Ankara accuses the movement of orchestrating a failed coup in 2016 and designates as a terrorist organisation. Speaking in Greece's Delphi Economic Forum, the EU Commissioner for Migration, Home Affairs and Citizenship Dimitris Avramopoulos also said Turkey fulfilled many criteria for visa liberalisation under the 2016 migrant agreement. “Turkey and Europe need each other,” he added. The commissioner said Turkey’s membership would be “beneficial for both EU and Turkey” and the country has left a positive impact on Greece in the last two years. The EU's 2016 refugee agreement with Turkey has been in force for two years. It was signed on March 18, 2016, in an attempt to solve one of Europe's most pressing problems: the enormous influx of refugees. Turkey, home to more than 3,5 million refugees, repeatedly threatened to terminate the agreement because the EU has not paid the stipulated amount, and the visa freedom for Turkish citizens provided for under the agreement has not been implemented. In the same conference, the Greek Defence Minister Evangelos Apostolakis said officials from Ankara and Athens decided to meet to reduce the tensions in the Mediterranean Sea which recently bittered the bilateral relations, according to Turkey's state-run Anadolu Agency. Political and military tensions between Turkey and Greece have escalated sharply since December 2017, when Turkish President Recep Tayyip Erdoğan said it was time to renegotiate an early 20th-century treaty that marked out the two countries’ common borders over gas exploration plans in the Mediterranean Sea. Last year, the survey ship of U.S. energy giant ExxonMobil arrived at the island of Cyprus as political tensions with Turkey over gas exploration rights in the Mediterranean persisted. 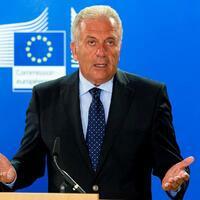 The European Union must accept Turkey’s internal security and terrorism concerns, an EU commissioner said on March 2.